The Dragon & Flagon is a tavern world-renowned for its most magical drink, The Dragon. Legend has it that one sip of The Dragon can give a hero wondrous abilities beyond their wildest dreams — but with a tavern full of thirsty adventurers and only one flagon left, things are bound to go wrong. Prepare your magic and grab your weapon because there''s only one true objective in this brawl — and it''s not just a sip of The Dragon. Only one can win and emerge with the reputation as the greatest fighter ever seen within the walls of The Dragon & Flagon! Play as one of nine unique and diverse characters in a 3D tavern environment that can be set up differently every time. Multiple play modes add even more variety. Will you leave with the greatest reputation from The Dragon & Flagon? 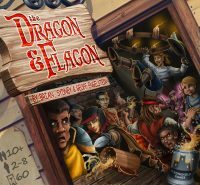 Add a Review for "Dragon and Flagon"